I’ve read a few books lately that have had a straightforwardness that I really appreciated. Maybe that doesn’t sound like the word that would entice you to pick up a book, maybe you’re looking for inspiring, or encouraging, or comforting, or relatable. In His Image: 10 Ways God Calls Us to Reflect His Character is the rare book that is all those things. I was anxious for the release of this book, because Jen’s previous book, None Like Him was one of my top 5 books the year it came out. That book focused on the ten ways God is not like us, and why not only is that a good thing but why we can trust Him in all things. It dealt with the fancy phrase incommunicable attributes of God, which simply means the ways we can’t be like Him because He is God. 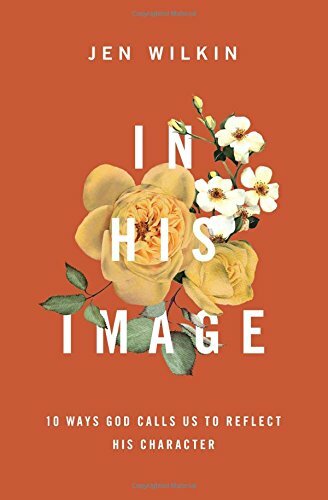 In His Image deals with the communicable attributes of God, the ways we can and are called to grow to be like Him. When I am overwhelmed by chaos and circumstance, failure and frustration I will ask the question, “What’s the point?” The answer that comforts me the most is from Romans 8:28, 29 “And we know that all things work together for good to those who love God, to those who are called according to His purpose… to be conformed to the image of His Son.” That’s the point. Through it all, by it all, God is working to conform us into His image and with that objective in mind, it gives me a comforting sense of purpose and meaning to what often seems futile and meaningless. This book helps us understand that objective. By looking at scripture, we learn both who God is and who He intends us to be in a way that is both inspiring and practical. The book begins with “A Better Question”. A hot topic in Christian circles is always how to know the will of God, the question of what should I do. Jen points out that, “For the believer wanting to know God’s will for her life, the first question to pose is not “What should I do?” but “Who should I be?” God, she goes on to say, does not hide His will from His children and then expect us to figure out what pleases Him. He clearly shows us who we are to be as we follow Him, and that is what influences what and how we do things. The questions are related, but the order determines whether we are confused or confident about our direction. It all begins with the seemingly impossible call to holiness, in which the author illuminates the important difference between doing the right kinds of things and being the right kind of person. The chapters progress from God Most Holy to God Most Loving, Good, Just, Merciful, Gracious, Faithful, Patient, Truthful and Most Wise. Each chapter has a well-crafted study section, perfect for both individual and group study and really key to applying the chapter to your life. She could have added more pages of her own thoughts to each chapter, but what your thoughts are, and how see the way to apply what you’ve learned to your own life is where change will happen for you on a personal level. The questions, like the chapters content, aren’t laborious. The topics seem as though they would be theologically heavy reading, but they aren’t. Jen Wilkin has the gift of being succinct, just enough words to bring light and instruction but not so many that you are weighed down with verbosity. This is rare, to be able to handle deep subjects with clarity that is concise and complete. I never come away from her books feeling shortchanged by her brevity. Instead, I have a clear retention of the main point. If I had twenty weeks to do a group Bible study, I would love to do None Like Him and In His Image back to back. There is a beautiful and beneficial progression to both these books that builds a strong foundation for our understanding of who God is, and who He wants us to become.